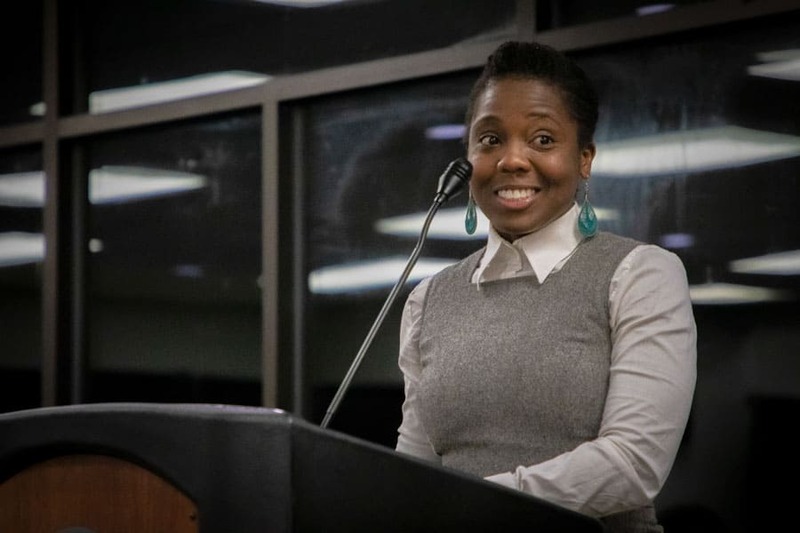 Dr. Shayna A. Wrighten, an associate professor of Biology and coordinator of the Pre-Dental Program at Francis Marion University, received the FMU African-American Faculty & Staff Coalition’s Diversity Award at the organization’s annual gala Thursday night on campus. The diversity award, given annually by the coalition, highlights the work of individuals who are dedicated to celebrating diversity and inclusiveness at FMU and beyond. Organizers noted Wrighten’s commitment to encouraging inclusivity, especially within the FMU student body. Wrighten is a native of Charleston, S.C. who joined the FMU faculty in 2012. She received her B.S. in neuroscience from Furman University and her Ph.D. in biomedical studies from the University of South Carolina School of Medicine. Wrighten’s honor highlighted the AAFSC’s 18th annual gala which is a fundraiser for the organization’s scholarship fund and other charitable activities. The AAFSC recognized 12 recipients of AAFSC-sponsored scholarships, heard from keynote speaker Kevin L. Jacobs, a local meteorologist and reacted enthusiastically when FMU President Dr. Fred Carter announced a new scholarship in honor of the late Dr. Freda Campbell Wilson, the founding director of FMU’s Speech-Language Pathology Program. The Campbell Wilson scholarship will go to minority students majoring in the health sciences. It joins four other named scholarships administered by the AAFSC. The organization’s goals include increasing morale, and communication among members; creating an atmosphere of community for FMU African-American faculty, staff and students; serving as a liaison between the administrative personnel of FMU and the African-American faculty and staff; and examining the university’s efforts in recruitment and retention of African-American faculty and staff. Past winners of the AAFSC Diversity Award included Dr. Rebecca Lawson, Dr. Louis Venters, Ms. Angela Crosland, Dr. Rhonda Brogdon, Ms. Yvonne Davis, Mrs. Crystal Graham, Dr. Will Wattles, Dr. Jason Owens and Dr. Ruth Wittmann-Price.